Enjoyable, well made animated adventure with likeable characters, a strong script and some decent set-pieces as well as a nice line in satire and some quietly subversive gags. Animated by a Japanese studio but with a British director (David Bowers) and a Hollywood-heavy cast, Astro Boy is based on the 1950s manga comic and anime created by Tezuka Osamu. The film takes place in a distant future where stylish Metro City floats above the rubbish-strewn surface of the earth and inventive genius Dr Tenma (Nicolas Cage) is responsible for creating a serving class of robots. When Dr Tenma's son Toby (voiced by Freddie Highmore) dies in a terrible accident at the hands of General Stone's (Donald Sutherland) malfunctioning peace-keeper robot, Tenma rebuilds him from his DNA as Astro Boy, a powerful robot with several special features. When Stone learns of Astro's existence, he determines to use his powers for evil but Astro escapes to the surface and falls in with a group of children – including Kristen Bell as Cora – and their adult guardian Hamegg (Nathan Lane). The voice cast are superb. Highmore makes a solid lead and there's strong work from Cage, Sutherland, Bell and Lane, as well as colourful supporting turns from the likes of Matt Lucas (as Sparx), Bill Nighy (as Dr Elefun) and, bizarrely, Samuel L. Jackson as Zog, a monosyllabic robot gladiator Astro is forced to fight in gladiatorial combat. The animation is lively and colourful throughout, with several nice surprises, some of which are borderline subversive – you won't believe where Astro keeps his machine guns, for example. It's also worth noting that Toby's death scene is quite shocking, so parents might want to warn younger children of the plot in advance. The script is very good, with a nice line in satire, both subtle (Earth used as a rubbish dump) and not-so-subtle (war-mongering general plotting pointless conflict), as well as a series of references to films such as Pinocchio, The Iron Giant, A.I. and the works of Miyazaki, all of which add depth to the story rather than being knowing references for their own sake. Similarly, the set-pieces are exciting and there are several good gags too. 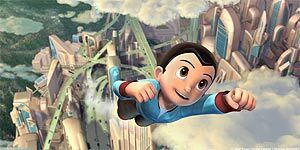 Astro Boy is an enjoyable, beautifully animated adventure that's exciting, funny and intriguingly dark in places. Highly recommended.